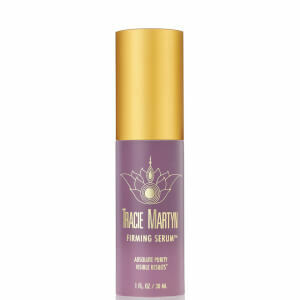 Another Pure yet Potent skin care creation from New York-based beauty guru Tracie Martyn the Resculpting Body Serum is an ultra-tightening and hydrating neck, jaw-line and body serum. Designed to target all problem zones where increased elasticity and firming is desired, this all-natural formula helps to regenerate by boosting skin's natural radiance through the power of peptides, amino acids and enzymes. Tracie's New York spa clients mentioned experiencing an immediate lifting effect. The Resculpting Serum improves the appearance of the skin by blending natural cosmeceuticals like Coenzyme A, also called the "master enzyme" with exotic botanicals including super-hydrating Asian Silver Tremella extract, nature's best version of hyaluronic acid. Targets stretch marks with a natural pumpkin extract and light diffusing minerals minimize the appearance of wrinkles. Leaves a silky hydrated feel on the skin. Massage Resculpting Body Serum on to neck, jawline, hips, thighs, legs, arms, torso, and any other are that needs lifting and hydration. The serum is best used as a spot treatment directly on problem areas. Allow the serum to absorb completely before applying Face and Body Resculpting cream. Use during the morning and evening for an immediate firming effect. Aqua (Water), Glycerin, Hydrolyzed Pumpkin Seedcake, Carnitine, Coenzyme A, Laminaria Digitata Extract, Avena Sativa (Oat) Kernel Extract, Tremella Fuciformis Polysaccharide, Caffeine, Carnosine, Hamamelis Virginana (Witch Hazel) Water, Mircocrystalline Cellulose, Silica, Cellulose Gum, Glyceryl Caprylate, Clyceryl Undecylenate, Citric Acid, Malic Acid, Xanthan Gum, Potassium Sorbate. This was my first purchase of this serum and I am glad I decided to try this in addition to using the Firming Serum. This serum is noticeably cooling and calming for my sensitive skin. The redness on my neck from my Rosacea fades after applying. It appears the lines on my neck have softened somewhat and I hope to see more improvement with time. Will continue to use.